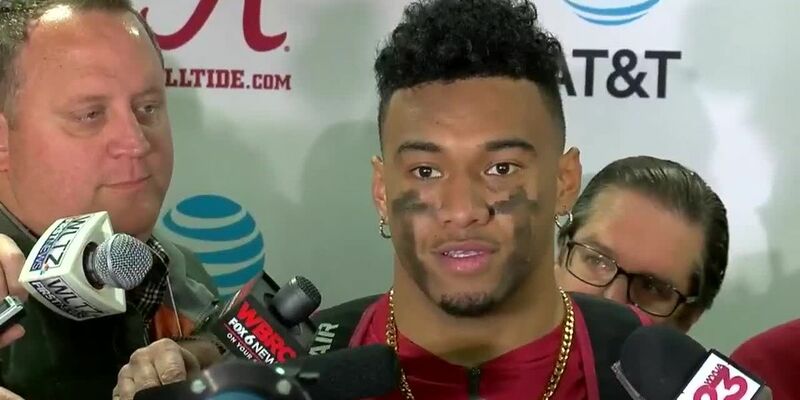 Tua Tagovailoa speaks after the 2018 Iron Bowl. BIRMINGHAM, Ala. (AP) — Southeastern Conference coaches have named Alabama quarterback Tua Tagovailoa and Kentucky linebacker Josh Allen as offensive and defensive players of the year. Kentucky's Mark Stoops is the SEC coach of the year in voting by league coaches announced on Wednesday. Texas A&M's Braden Mann is the pick as top special teams player and Crimson Tide receiver Jaylen Waddle is freshman of the year. Alabama players also claimed two other awards. Tagovailoa is a finalist for the Heisman Trophy and led Alabama into the College Football Playoffs. Allen won the Bronko Nagurski Trophy as the nation's top defensive player.